Est. 2007 Little Stars Nursery’s priority is to provide a friendly, secure and stimulating setting for children aged 2 + until 5 years, in which we encourage children to learn through structured and free play. We also take great pride in ensuring each child develops emotionally, intellectually and socially, providing support and assistance at all times. This has for the second time been recognised by Ofsted who awarded us an outstanding assessment in 2011 and again in October 2015. All activities carried out on a daily basis are varied, in order to prepare each child for the next stage of schooling whilst keeping children interested and stimulated, through the Early Years Foundation Stages. Encouraging children to become more independent and confident is an important aim of this nursery. We specialise in individual needs of children, recognising that all children are different and that all needs must and should be met. The setting consists of a main hall which is divided into smaller play areas. This consists of Art, writing, ICT, Book corner, Role Play, Construction and small world. It also contains a new kitchen, for staff use only and separate girls and boys toilet facilities along with cloakrooms. A new disabled toilet and parking facilities were provided in 2012 and in Summer 2013 both the female and male toilets have been totally refurbished. This was to bring them up to date and designed to enable us to take on younger children. 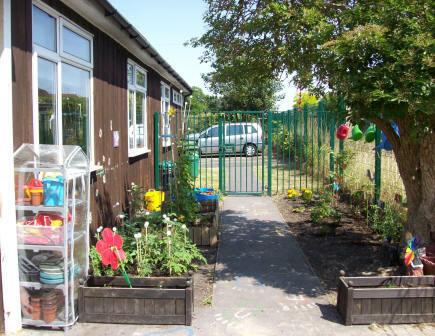 A large rubberised safety area was installed in 2011 to the rear of the Hall to allow for all year round activities, with teacher supervision at all times. Gates either side of the Hall leading to the rear play areas are always secured for the safety of the children. There is off road parking facilities outside the Hall. When joining the nursery, all children and parents are invited and welcomed to an informal introductory visit, in which the setting can be observed and an opportunity for staff to meet parents and children and vice versa. Any further details we feel you might require should be contained in our Policy and Procedure documents opposite. Little Stars Nursery is open 38 weeks a year, opening on Monday to Friday mornings from 8.30 a.m. – 11.30 a.m., and Monday to Thursday (no Friday) afternoons from 12.15 p.m. – 3.15 p.m.
> Safe guarding children Policy and Procedure. Safe guarding children - E Policy. Safe guarding children - FGM.